Angela Snow and her husband Dave have had a roller-coaster of a ride running a 180 acres sheep farm near Great Malvern in Worcestershire, since she acquired the land in 1996. With ambition and vision, their flock had expanded to over 1000 ewes, but was dealt a devastating blow by the 2001 foot and mouth outbreak forcing the couple to diversify. Converting the winter beef barn, the only building then on the farm into loose boxes the Snow's started an equestrian livery business, and being right in the middle of prime riding country, the new venture flourished. The Snow's subsequently added a menage and the venture continues to provide an agreeable additional income to the farm. Their most recent diversification project has involved turning to Norwegian Log Buildings to provide log cabins as ideal holiday lets and these could prove to be the key to their future success. Originally having looked at acquiring a small local bungalow in May 2009 as a holiday let; it unfortunately went for over their reserve but a new bank manager encouraged her to pursue her 'plan-B' Scandinavian style log cabins, which he had also seen other landowners install for rental and holiday lets with a great deal of success. Angela began surfing the internet for suitable suppliers and a leaflet on 'Diversification in Farming' from Norwegian Log Buildings caught her eye. Visiting the Norwegian Log showroom in Reading and seeing the product up close, Angela was immediately impressed with the solid log construction; the warmth of the building; and the flexibility of the design. Having a solid history of providing log buildings in rural locations, Norwegian Log were able to provide the Snow's with a number of actual case studies in the locality, showing how the log construction fits into the rural landscape. 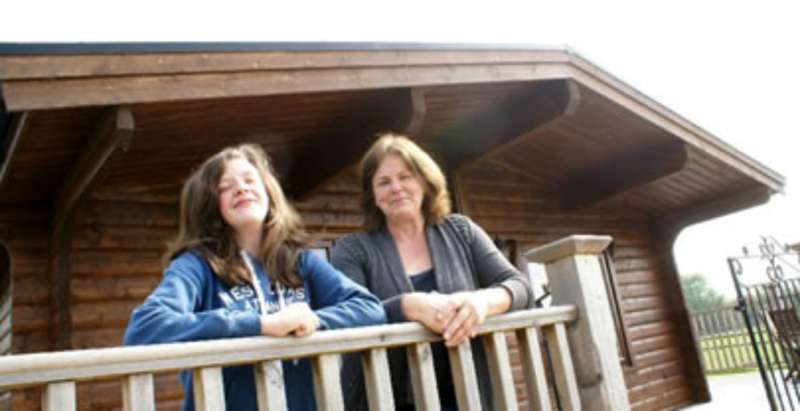 Angela was pleased to learn that the log homes provided by Norwegian Log are transportable and so comply with the Caravan Act as a mobile home. If built to BS3632 (the specification for a Park Home construction) they are also exempt from VAT and not subject to Building Regulations. What's more, buildings from Norwegian Log meet the National Planning Policy Framework requirements for an agricultural building for the accommodation of rural workers, further increasing the versatility and appeal of these buildings within the farming community. With the help of a local planning consultant the Snow's were granted permission for two log cabins on their farm, which was the next phase of their diversification plan. The size of the Norwegian Log building chosen by the Snow's was 16.5m x 6.8m and includes a reception area, a large, open family room (comprising kitchen sitting room and dining room), three bedrooms, and two bathrooms; with all the rooms being light and airy providing a great sense of space. The finished building faces due south and gets breathtaking views of both the sunrise and sunset over the Malvern countryside. The addition of large private decks, accessible from the bedrooms and the family room, provides the overall impression of space and means that sense of being very much part of the countryside was achieved. The comments that the Snow's are receiving in their visitor's book are highly complementary, not just due to the location of the farm and the service they receive from their hosts, the compliments relate to the Norwegian Log cabin as well. A visit doesn't go by without the guest commenting on how they love staying in the building. As an extension to the Snow's existing rural business, the new Norwegian Log building is proving to be a successful addition to the farm. With planning already agreed for cabin number two and capacity on the site services, installing the second building will be simple process when the time is right. David and Angela are now changing the way their rural business operates. A website has been designed to promote the business and they have become a member of Farm Stay UK. The Snow's have engaged with various rural wedding venues making their accommodation available, further extending the ambition and vision the couple has for the farm. With the help of Norwegian Log Buildings the Snow's farm has become a rural destination, proving that diversification is the key to future success in farming.